alternative to legacy restroom cleaning systems. Less water means less chemical. 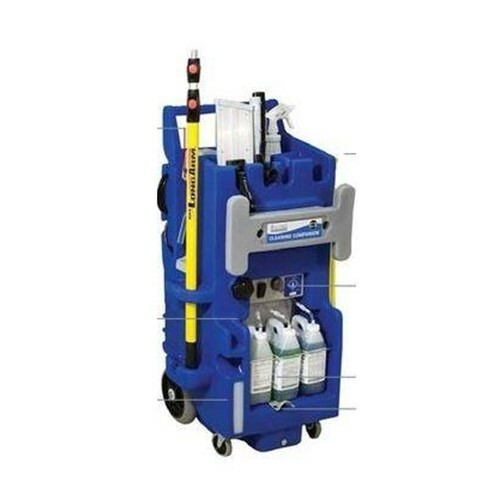 Lower pressure provides greater safety to cleaning staff as well as the surfaces you are cleaning. With reduced water usage, demand for recovery dramatically changes. In daily cleaning regimens, water is minimized, allowing micro fiber alternatives that remove the excess solution from the floor without risk of re-soiling. While the C3XP has changed the way cleaning professionals work, Hillyard continues to improve the cleaning processes of restroom hygiene. The C3HP is designed to handle tougher cleaning jobs. The C3HP has a pressure rating of 300 psi at the pump which aids in removing stubborn soils, and provides a faster method to flush soils to the drain. Manual Cleaning- It's Hard, Demoralizing Work! Hillyard Cleaning Companions Make Cleaning Easier- Everyday! Bending, reaching and scrubbing! It is the main reason restrooms continue to be the largest source of complaints, and the biggest cleaning headache for facility managers. With traditional, manual methods, surfaces rarely get the thorough cleaning they need, creating unsightly conditions and the perfect breeding ground for odor-causing bacteria! Surfaces in bathrooms, like the undersides of fixtures, partitions and grout lines will finally get the attention they deserve, improving restroom facilities, cleaning quality, and staff morale! Formulas designed specifically for safe and effective cleaning when using a pressurized cleaning system. Sealed chemical refills are stored in the back of the C3. When the application gun trigger is activated, the water and product automatically mixes at the specified dilution rate and is applied to surfaces. Remove the soiled solution with the option that best meets your needs. Squeegee. Flat mop. On-board vacuum. The soil and filth your staff is trying to remove mixes with the same solution used for cleaning. That?? ?s gross! Mops spread filth and dirt, Cleaning Companions remove it. Downstream injection allows the user to switch from chemical application mode to rinse mode at the gun instead of walking back to the base unit, simplifying the cleaning process and improving productivity. Higher Pressure System- 300 psi pump is strong enough to remove heavy, stuck on soils without damaging grout or fixtures. Lower Pressure Apply Higher Pressure Rinse- Quickly change pressure at the gun. Safely apply chemical with low pressure. Rinse and remove soil with high pressure. Variable Angle Spray Pattern- Use a pinpoint, tight pattern to quickly remove stubborn soils. Use a wide fan to rinse and for wide area coverage. Right Flow Rate- 0.65 gmp flow rate provides the right amount of volume to clean without wasting water. Environmentally preferred. Cord Electric- Provides continuous power, eliminating power constraints and charging issues associated with battery systems.